Check out who will win today’s cricket match? In Today’s Dream11 Fantasy Cricket Prediction CSK vs KKR 33rd T20 Match IPL 2018, we will cover playing 11, pitch report of Eden Gardens, Kolkata and toss prediction. To win any fantasy leagues you need to details of the match. So here comes crix11.com, we will give you all the details which may lead you to win the grand league. The details will include players recent and past performance, dream11 guru prediction, weather report of Kolkata. We will also cover all the latest news and updates related to Chennai Super Kings and Kolkata Knight Riders, key players, the best team for dream11, the best choice for captain and vice-captain, where to watch the live match of KKR vs CSK and live streaming details. All the details that we provide are absolutely FREE, you don’t have to pay a single penny. Make sure to read the complete post to get 100% benefit. Where Can You Watch the Live Streaming of KKR vs CSK or Channels to Watch? Who Will Win the 33rd Match of IPL 2018 Between KKR vs CSK and Toss Prediction? What is the best combination of players for Dream11 in 33rd Match? Date: The match will be played on 3rd May 2018 (Thursday). 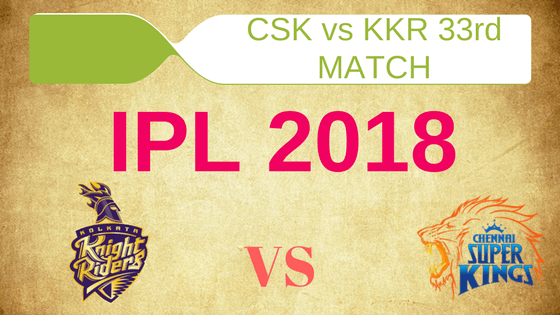 Match: Indian Premier League, KKR vs CSK, IPL 2018. The pitch of Eden Gardens has totally contrasting behaviour as compared to a couple of years back. Today the pitch will be batting friendly. Expect rain of runs in this ground. Although the pitch will support the batsman, the fast bowlers can take some advantage if they hit the deck hard and bowl in a right area. Note: If you know how the pitch will behave, you can make the best teams according to the pitch. Note: If you know the scoring pattern, you can easily know which team can win. Rain, Rain, and Rain. Guys bad news for you. Today whole day we can see scattered thunderstorms. Before the match, it will be partly cloudy and at the time of the play, again there will be scattered thunderstorms. The temperature is expected to be 29-Degree Celsius and the humidity to be 75%, which may rise up to 84%. In last five matches, KKR won 2 games out of 5 games whereas CSK won three matches out of five matches. In overall encounters, Chennai Super Kings won 11 matches against KKR and Kolkata Knight Riders won 6 matches against Dhoni’s Boys. Note: if you know the previous record of both the teams against each other, then you will get a fair idea that which team can win. Star Sports has paid a huge amount of INR 16,347.50 Crores to get exclusive rights of IPL 2018 for live coverage for five years starting from 2018 to 2022. Star Sports has all the media rights including TV and all Digital Rights. You can watch the full match of Chennai Super Kings vs Kolkata Knight Riders on Star Sports. Suresh Raina, Shane Watson, MS Dhoni, Kshitiz Sharma, Faf du Plessis, Monu Kumar, Ambati Rayudu, Karn Sharma, N Jagadeesan, Dwayne Bravo, Imran Tahir, Harbhajan Singh, Lungi Ngidi, Ravindra Jadeja, Chaitanya Bishnoi, Sam Billings, KM Asif, Kanishk Seth, Murali Vijay, Dhruv Shorey, Mark Wood, Shardul Thakur, David Willey. Robin Uthappa, Chris Lynn, Apoorv Wankhade, Mitchell Johnson, Sunil Narine, Dinesh Karthik, Shubman Gill, Vinay Kumar, Javon Searles, Piyush Chawla, Nitish Rana, Cameron Delport, Rinku Singh, Andre Russell, Tom Curran, Shivam Mavi, Prasidh Krishna, Kuldeep Yadav. Both the teams have won their last match and will be high on confidence. Csk is in number one position in the points table whereas Kkr is at number four at the points table. Chennai Super will fight to be at the top of the points table and Kolkata Knight Riders will try to improve and go up in the table. It will be interesting to see how both the teams make their playing 11 combinations. After winning their last game, it is very unlikely that KKR will make any change but there could be a forced change if Nitish Rana is declared unfit. Rinku Singh or Ishan Jaggi can replace Rana if he doesn’t pass the fitness test before the match. Sunil Narine, Dinesh Karthik (capt & wk), Chris Lynn, Shivam Mavi, Robin Uthappa, Tom Curran/Mitchell Johnson, Nitesh Rana/Ishank Jaggi/Rinku Singh, Kuldeep Yadav, Andre Russell, Piyush Chawla, Shubman Gill. Dhoni had made four changes in his team in the previous game and it’s very rare to see. CSK may bring Shardul Thakur back in place of KM Asif. Chennai Super Kings will play with same playing 11 except a couple of changes if required. Faf du Plessis/Sam Billings, Ambati Rayudu, Shane Watson, Lungi Ngidi, MS Dhoni (capt & wk), Suresh Raina, Dwayne Bravo, Shardul Thakur/KM Asif, Ravindra Jadeja, Harbhajan Singh, Karn Sharma. Note: If you know the playing 11 of both the teams before the match your winning chances increases. Pro tips: You can choose Dhoni over Karthik as MSD is in destructive form. Make a combination of players for multiple teams. Pro tips: The above players are most likely to perform. Make a combination of players for multiple teams. Playing of Nitish Rana is very less but if you are playing with more than one team, then you can keep him in your any one team. Pro tips: All the above players are important, so make a combination of the players for multiple teams. Pro tips: These bowlers are likely to perform. You can make a combination from the above list. You can also take bowlers from playing 11. Pro tips: You can take captain and vice-captain from the above list. Pro tips: The above players have performed in the previous matches. You can keep them as a captain and vice-captain. Chennai Super Kings is in a tremendous form. All the players in their team is performing at their best. Only concern for Dhoni would be their bowling department. According to our cricket experts and astrology prediction, Chennai Super Kings will win the match. Our cricket experts says that the team winning the toss should bat first. But today KKR will win the toss and elect to field first. This decision will help CSK in winning the today’s match. As the pitch will support the batsmen, all the three all rounders are must to have in any team. Rayudu and Raina is in great form so you can’t avoid them. There is a chance that Shubman Gill will be promoted up in the batting order, so he is also a good option. Conclusion: This is it for Today’s Dream11 Fantasy Cricket Match Prediction of CSK vs KKR, 33rd T20 Match, IPL 2018 which will be played on Thursday 3rd May. You can give your valuable feedback in the comment section. Subscribe to our notification of latest updates. GOODBYE!